"Barb City" redirects here. For other uses, see Barb (disambiguation). The Egyptian Theatre in Downtown DeKalb. Location of DeKalb in DeKalb County, Illinois. DeKalb /dɪˈkælb/ is a city in DeKalb County, Illinois, United States. The population was 43,862 according to the 2010 census, up from 39,018 at the 2000 census. The city is named after decorated Franconian-French war hero Johann de Kalb, who died during the American Revolutionary War. DeKalb was originally called Huntley's Grove, and under the latter name was platted in 1853. The name is for Baron Johann de Kalb, a major general in the American Revolutionary War. A post office has been in operation at DeKalb since 1849. The development of barbed wire is key in the history of DeKalb. Joseph Glidden, who developed barbed wire, was a historic citizen of DeKalb. Glidden would ultimately be known as the “Father of Barbed Wire”. Glidden began to mass-produce his invention, and eventually sold half of the company to Isaac L. Ellwood. Together, the two formed the Barb Fence Company. 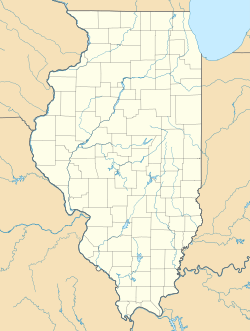 The city of DeKalb is in northern Illinois, United States, roughly 55 miles west of downtown Chicago and roughly 30 miles southeast of Rockford, IL. The Kishwaukee River flows northward through the city of DeKalb. According to the 2010 census, DeKalb has a total area of 14.812 square miles (38.36 km2), of which 14.65 square miles (37.94 km2) (or 98.91%) is land and 0.162 square miles (0.42 km2) (or 1.09%) is water. Wikimedia Commons has media related to 2007 Kishwaukee River flood in DeKalb. On August 24, 2007, the Kishwaukee River at DeKalb crested at 15.27 feet (4.65 m) (all-time record 15.8 feet (4.8 m)) causing major flooding. This was only the second time the river has risen above 15 feet (4.6 m) since the level of the river has been recorded. DeKalb has a humid continental climate (Köppen climate classification Dfa) typical of northern Illinois, with four distinct seasons. Summers can be hot, while winters are cold and snowy. Precipitation is somewhat uniform year-round, although it can be heavier in the spring and summer when the area is prone to strong thunderstorms. A home in the neighborhood north of downtown DeKalb, near the Gurler House. As of the census of 2010, there were 43,862 people, 15,386 households, and 7,508 families residing in the city. The population density was 2,993.8 people per square mile (1,157.3/km²). There were 16,436 housing units at an average density of 1,121.9 per square mile (433.7/km²). The racial makeup of the city was 74.9% white, 12.8% African American, 0.3% Native American, 4.1% Asian, 0.0% Pacific Islander, 5.5% from other races, and 2.4% from two or more races. Hispanic or Latino of any race were 12.5% of the population. There were 15,386 households out of which 26.6% had children under the age of 18 living with them, 33.2% were married couples living together, 11.2% had a female householder with no husband present, and 51.2% were non-families. 29.7% of all households were made up of individuals and 6.6% had someone living alone who was 65 years of age or older. The average household size was 2.44 and the average family size was 3.07. In the city, the population was spread out with 17.6% under the age of 18, 37.3% from 18 to 24, 22.6% from 25 to 44, 15.0% from 45 to 64, and 7.5% who were 65 years of age or older. The median age was 23.6 years. For every 100 females, there were 101.2 males. For every 100 females age 18 and over, there were 100.4 males. The median income for a household in the city was $37,719, and the median income for a family was $59,671. Males had a median income of $43,819 versus $36,488 for females. The per capita income for the city was $19,155. About 19.6% of families and 32.5% of the population were below the poverty line, including 31.0% of those under the age of 18 and 5.7% of those age 65 or over. DeKalb is home to the annual event Corn Fest which is usually held in late August. The Egyptian Theatre, built in 1929, is one of a handful of such theatres still extant in the United States. The Stage Coach Players, founded in 1947, have their own theatre on 5th Street. DeKalb is home to Northern Illinois University, the city's largest employer and the third largest campus in the state. Other large employers include Northwestern Medicine, General Electric, Monsanto (originally as DeKalb Corn), the local school district, and a large retail district along Hwy. 23 (and shared with Sycamore) that includes Walmart, Target, Lowes, Best Buy, Sears, Kohl's, Ross, and dozens of other chain and local stores. DeKalb is also home to warehouses for several major companies, including Target, 3M, Nestlé, and Panduit, in part due to Dekalb's proximity to major highways such as I-88 and I-39. 3M's complex serves as the distribution hub for three of 3M's four business units and export operations to North America, Europe, Africa, the Middle East and Latin America. The DeKalb Park District is responsible for the 44 parks and recreation facilities in DeKalb. The park district was established in 1935 through the initiative of members of the League of Women Voters, to address the need for a public swimming pool in the community. The City of DeKalb gave the first four parks to the District: Annie's Woods, Huntley Park, Liberty Park, and Hopkins Park. By 1960, the district had eight parks and by 1970 twelve. Initially the main services provided focused on swimming and use of the outdoor parks. But as lifestyles changed, so did the district. In the mid 1960s, the City gave the Ellwood House mansion to the district. In 1970, the park district hired its first full-time executive director and by 1980, the district had a pool, acquired Haish Gymnasium and Buena Vista, a nine-hole golf course. In 1985, the park district purchased River Heights, a second nine-hole golf course, which was later developed into an 18-hole course. New parks were acquired as conservation areas in order to preserve floodplain lands and wildlife habitat. Other parks were established as community-wide active recreation facilities designed to serve all types of recreational uses. In addition to this system of parks the district established the Kishwaukee Kiwanis pathway system totaling over 8 miles in length, connecting DeKalb with Sycamore and the Great Western Trail to the east. In 2000 the district opened the Sports and Recreation Center, a multi-function facility that features in indoor field of over 1 acre, clear-span space with synthetic field turf. The park district provides year-round athletic and recreation programs including day camps, youth baseball and softball, adult softball leagues both indoors and outdoors, swimming lessons, golf lessons, karate, tennis, adult and youth basketball leagues, indoor soccer, fitness classes, and preschool. DeKalb is governed by a Council-Manager government. Policy is developed by an elected City Council then implemented by an appointed professional City Manager. DeKalb's City Council is made up of a Mayor, elected at-large, and seven alderpersons, elected by ward. Each serves a four-year term, with half the council being elected every two years. A City Clerk is also elected every four years who serves as the official record keeper of the city. City council meetings are held the second and fourth Mondays of every month. There are 11 public schools, one private school, one university and one public library. "DeKalb". mywikicity.com. Archived from the original on March 6, 2008. Retrieved December 8, 2016. Altgeld Hall, the first building to be constructed at NIU. Northern Illinois University (NIU) was founded in DeKalb as the Northern Illinois State Normal School in 1895. NIU is a comprehensive teaching and research institution with total enrollment around 20,000 (including about 16,000 undergraduates and 300 law school students), which makes NIU the third largest campus in Illinois. NIU is home of the Huskies. Notable NIU alumni include Dan Castellaneta (the voice of Homer Simpson and Krusty the Clown), Jimmy Chamberlin (The Smashing Pumpkins drummer), former U.S. House Speaker Dennis Hastert, former Labor Secretary W. Willard Wirtz, Oscar-nominated actress Joan Allen in Pleasantville (film), NFL players Michael Turner, Doug Free, Chandler Harnish, Jordan Lynch and Ryan Diem, former NBA Players Kenny Battle and Paul Dawkins, and actor Steve Harris from David E. Kelley's legal Drama The Practice. DeKalb is served by both public and private school systems. DeKalb Community Unit School District 428 operates eight elementary schools (Grades K-5), Clinton Rosette and Huntley Middle Schools (Grades 6-8), and DeKalb High School (Grades 9-12), which is the Home of the Barbs. DeKalb is also home to St. Mary's Catholic Grade School (Grades K-8). DeKalb Taylor Municipal Airport (DTMA) or (KDKB), serving the general aviation community, is at 3232 Pleasant Street, DeKalb, Illinois. This article is about individuals from DeKalb. For individuals who attended or worked at Northern Illinois University, see List of Northern Illinois University people. George Franklin Barber, architect, known as one of the most successful American domestic architects of the late Victorian period. He was born in DeKalb. A. J. Bramlett, former professional basketball player for the Cleveland Cavaliers. Cindy Crawford, model and actress, appeared on hundreds of magazine covers throughout her career and in 1995 was named the world's highest-paid model by Forbes. She was born and raised in DeKalb. Joseph B. Ebbesen, optometrist and Illinois state legislator. Isaac L. Ellwood, rancher, businessman and barbed wire entrepreneur. Fred Eychaner, media mogul and philanthropist. He was raised in DeKalb. Rich Eychaner, businessman and LGBT rights advocate. He is the brother of Fred Eychaner. Joseph Glidden, farmer who patented barbed wire in 1874, which changed the development of the American West. Jacob Haish, one of the inventors of barbed wire. Barbara Hale, film actress and Emmy Award-winning co-star of Perry Mason television series. Andrew Harris, black metal multi-instrumentalist from the band Judas Iscariot. Mike Heimerdinger, assistant coach for several NFL teams including the Denver Broncos and Tennessee Titans. He was born and raised in DeKalb. Richard Jenkins, actor, nominated for the Academy Award for Best Actor and Best Supporting Actor for his performances in The Visitor (2007) and The Shape of Water (2017) respectively. He was born and raised in DeKalb. Alan and Dale Klapmeier, co-founders of the Cirrus Design Corporation and 2014 inductees into the National Aviation Hall of Fame. They were raised in DeKalb and graduated from DeKalb High School. Doug Mallory, coach of the Atlanta Falcons. He attended DeKalb High School while his father was coach of the Northern Illinois Huskies. Karl Nelson, offensive tackle for the New York Giants. He played football for the DeKalb High School Barbs. Mel Owens, linebacker for the Los Angeles Rams from 1981 to 1989. He played football for the DeKalb High School Barbs. Richard Powers, author and winner of the 2006 National Book Award for Fiction for The Echo Maker. Weekend Nachos, powerviolence punk band. They were formed in DeKalb. W. Willard Wirtz, United States Secretary of Labor during the Kennedy administration and Johnson administration. He was born and raised in DeKalb where his home is preserved on the campus of Northern Illinois University. ^ "2016 U.S. Gazetteer Files". United States Census Bureau. Retrieved June 29, 2017. ^ a b "History of DeKalb - DeKalb, IL". www.cityofdekalb.com. ^ Callary, Edward (September 29, 2008). Place Names of Illinois. University of Illinois Press. p. 90. ISBN 978-0-252-09070-7. ^ Chicago and North Western Railway Company (1908). A History of the Origin of the Place Names Connected with the Chicago & North Western and Chicago, St. Paul, Minneapolis & Omaha Railways. p. 63. ^ "DeKalb County". Jim Forte Postal History. Retrieved November 3, 2015. ^ South Branch Kishwaukee River at DeKalb, Advanced Hydrologic Prediction Service, National Weather Service. Retrieved August 25, 2007. ^ "NowData - NOAA Online Weather Data". National Oceanic and Atmospheric Administration. Retrieved May 31, 2016. ^ "American FactFinder". United States Census Bureau. Archived from the original on September 11, 2013. Retrieved June 14, 2015. ^ "History of Corn Fest". DeKalb Corn Fest. Retrieved July 6, 2017. ^ "Arts and Culture - DeKalb County Convention and Visitors Bureau". DeKalb County Convention and Visitors Bureau. Retrieved July 7, 2017. ^ "Stage Coach Players". www.stagecoachers.com. Retrieved July 7, 2017. ^ a b "NIU, 3 other Illinois universities' credit rating lowered". ^ "Why Dekalb County?". DeKalb County Economic Development Corporation. Retrieved June 5, 2014. ^ "Executive Profile - Eric Wasowicz". Bloomberg Businessweek. Retrieved June 5, 2014. ^ "Fujitsu Consulting Acquires Illinois-based Greenbrier & Russel". Retrieved June 5, 2014. ^ "City Council | DeKalb, IL". www.cityofdekalb.com. Retrieved July 6, 2017. ^ "Northern Illinois University". Forbes. Retrieved June 5, 2014. ^ "Law School - Northern Illinois University". US News and World Report. Retrieved June 5, 2014. ^ Michael Tomlan, Introduction to George F. Barber's Victorian Cottage Architecture: An American Catalog of Designs, 1891 (Dover Publications, 2004), pp. v-xvi. ^ M. Ruth Little (2009). Barber, George F. (1854-1915), North Carolina Architects and Builders, A Biographical Dictionary. Website maintained by North Carolina State University Libraries. Accessed May 3, 2011. ^ "A.J. Bramlett Player Profile, Cleveland Cavaliers, NBA Stats, NCAA Stats, Game Logs, Bests, Awards". Basketball.realgm.com. Retrieved August 7, 2016. ^ Poulisse, Adam (October 3, 2015). "DeKalb's Cindy Crawford: Model's roots featured in her autobiography, 'Becoming'". Daily Chronicle. DeKalb, Illinois. Retrieved March 12, 2017. ^ a b c Krell, Alan (February 3, 2002). The Devil's Rope: A Cultural History of Barbed Wire. Islington, London, England: Reaktion Books. p. 23. ISBN 978-1861891440. ^ a b McCormick, John (June 7, 2005). "Fred Eychaner: Reclusive millionaire is one of the nation's top Democratic donors". Chicago Tribune. Chicago, Illinois. Retrieved March 12, 2017. ^ Wright, Gilson (April 15, 1973). "Barbara Hale is "my kind of people" says writer". The Journal News. p. 12. Retrieved September 4, 2015 – via Newspapers.com. ^ Litsky, Frank (October 1, 2011). "Mike Heimerdinger, 58, Who Helped to Coach Super Bowl Winners, Is Dead". The New York Times. New York City. Retrieved March 12, 2017. ^ Benjamin Secher (June 28, 2008). "Richard Jenkins: bald, 61 years old - and a star at last". Telegraph.co.uk. Retrieved October 13, 2010. ^ Reference for Business - Company History Index. "Cirrus Design Corporation - Company Profile, Information, Business Description, History, Background Information on Cirrus Design Corporation". Retrieved June 11, 2014. ^ DeKalb Barb Football [@dekalb_football] (November 13, 2015). "Big thanks to DeKalb Alumni and current Atlanta Falcons Coach Doug Mallory for the conference call to the Barbs football team today" (Tweet) – via Twitter. ^ Conklin, Mike (September 8, 1987). "Stricken Giant`s Father Dismisses Cancer Link". Chicago Tribune. Chicago, Illinois. Retrieved March 12, 2017. ^ "Mel Owens". Pro-Football-Reference.com. Sports Reference LLC. Retrieved March 20, 2015. ^ Schrader, Barry (January 21, 2014). "Richard Powers produces 11th novel". Daily Chronicle (Illinois). DeKalb, Illinois. Retrieved March 12, 2017. ^ Cimarusti, Luca (January 10, 2017). "Weekend Nachos leave behind a legacy of brutality". Chicago Reader. Chicago, Illinois. Retrieved March 12, 2017. ^ Weil, Martin (April 25, 2010). "Willard Wirtz, labor secretary for JFK and LBJ, dies at 98". The Washington Post. Washington, D.C. Retrieved March 12, 2017.